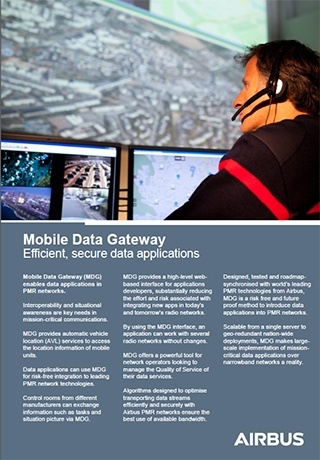 The Mobile Data Gateway, MDG makes it possible to integrate 3rd party data applications into the Airbus TETRA and Tetrapol networks without risk to confidentiality. The MDG is very efficient because it uses special algorithms to prevent unnecessary exchanges over-the-air. The MDG includes Automatic Vehicle Location (AVL) server functionality. It can scale from tactical, laptop based configurations up to a nationwide shared service. MLP (Mobile Location Protocol) - which means that MDG can handle location information from commercial cellular networks. The MDG is a powerful tool for network operators looking to manage the Quality of Service of their data services. 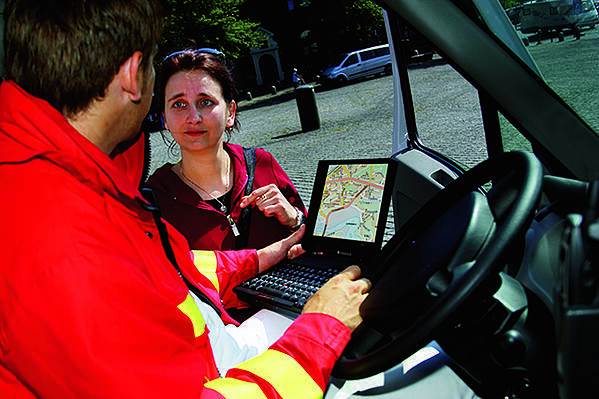 Algorithms designed to optimize transporting data streams efficiently and securely Airbus TETRA and Tetrapol networks ensure the best use of available bandwidth. Designed, tested and roadmap-synchronised with the PMR solutions from Airbus , the MDG is a future proof method to introduce data applications into PMR networks. The MDG provides a web based interface for application developers. This makes it easier to integrate new applications in today’s and tomorrow’s radio networks. When an application uses the MDG interface, it will be able to work with several TETRA and Tetrapol radio networks without changes. Scalability: from laptop based tactical systems to nationwide geo-redundant systems.